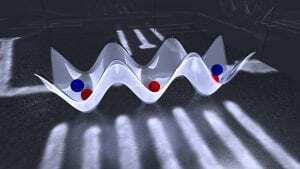 Quantum behaviour plays a crucial role in novel and emergent material properties, such as superconductivity and magnetism. Unfortunately, it is still impossible to calculate the underlying quantum behaviour, let alone fully understand it. Scientists of QuTech, the Kavli Institute of Nanoscience in Delft and TNO, in collaboration with the ETH Zurich and the University of Maryland, have now succeeded in building an ‘artificial material’ that mimics this type of quantum behaviour on a small scale. In doing so, they have laid the foundations for new insights and potential applications. Their work is published today in Nature. 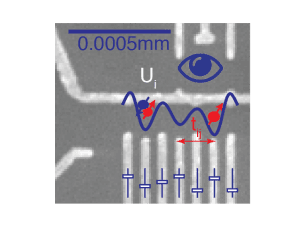 Within the last century, an understanding of the underlying physics of semiconductor materials has led to many technological improvements, such as computer chips becoming ever faster and smaller. We are, however, gradually reaching the limits of Moore’s Law: a doubling in computing power for half the price every two years. But there is still much more uncharted territory to be explored. Professor Vandersypen: ‘There is so much physics left to discover if we truly want to understand materials on the very smallest scale.’ And that new physics is set to bring even more new technology with it. Professor Vandersypen: ‘The difficulty is that, at this scale, quantum theory determines the behaviour of electrons and it is virtually impossible to calculate this behaviour accurately even for just a handful of electrons, using even the most powerful supercomputers.’ The scientists are now combining the power of the semiconductor industry with their knowledge of quantum technology in order not to calculate the behaviour of electrons in materials, but to mimic it. We call this quantum simulation. Vandersypen: ‘I hope that, in the near future, this will enable us to learn so much about materials that we can open some important doors in technology, such as the design of superconductors at room temperature, to make possible loss-free energy transport over long distances, for example. Prof. Lieven Vandersypen (right) with doctoral candidate Toivo Hensgens. Photo credit Marieke de Lorijn. Want to learn more? Listen to this interview at Radio 1 with prof Vandersypen!